3.1 What is the connection between Waking Titan and No Man's Sky? 3.2 What are the relations between events in-game and Waking Titan? 3.3 What is W/ARE's relationship with Myriad and The Atlas Foundation? 3.4 What happened to the other dreamers? 3.6 What are the Atlas Pass v4s? Sort by companies and organizations introduced in the first "season" of Waking Titan. Dedicated to determining the true nature of reality, The Atlas Foundation hosts a family of businesses (Echo, Myriad, Superlumina, and Multiverse) all playing crucial roles in their experiments. Elizabeth Leighton - The CEO of The Atlas Foundation, and director of the Citizen Science Division. Major Sophie Dubois ("Metis") - on assignment with The Atlas Foundation as part of the Pentagon's Titanwatch Task Force. She worked as an overseer of the foundation's progress on precise predictive technology for its potential applications in propaganda and military strategizing. The Citizen Science Division (CSD) is a collective of individuals who were recruited by The Atlas Foundation via a series of puzzles and radio ads at the beginning of Project Waking Titan. The purpose of this division was said to be gathering a collective of individuals who could generate a chaotic enough environment viable to test Loop16's predictive capabilities in. All players of the ARG are addressed as part of this collective. Waking Titan Console(Mercury OS) - An interface allowing you to connect directly to Loop16, and access a plethora of commands providing status updates, lore and puzzles. A list of discovered commands can be found on the Console Commands page. Partnered with The Atlas Foundation, Myriad is a low-orbit satellite-based data storage company. They help to provide the flexible processing power required for The Atlas Foundation's experiments, specifically in artificial intelligence. Partnered with The Atlas Foundation. Echo is a service established to help people cope with the deaths of loved ones. Echo uses patented voice recognition software to accurately recreate the voice of any one particular person with a mere 5-minute audio sample. Partnered with The Atlas Foundation, Multiverse Technologies conducts research in the fields of computationalism, particle acceleration, and electrodynamics. Partnered with The Atlas Foundation. Creator of the world's first antitelephone. Edison Township Amateur Radio Club (E.T.A.R.C) is a club for HAM radio enthusiasts in Edison Township, New Jersey. Emily Warren - Ham radio enthusiast and moderator of the ETARC forums before it was revealed that "Emily" was Loop16's persona. It has since been re-branded to the official forums for the Citizen Science Division. Old Gods - A mysterious entity distributing Atlas Foundation emails. It has its own account on the ETARC forums, and its profile picture and name are references to Nyarlathotep from the H.P Lovecraft Mythos. Sort by companies and organizations introduced in Season 2 of Waking Titan. Based in Beijing, China, W/ARE creates special post-VR headsets that allow you to enter virtual worlds within your dreams. Emily praised W/ARE for their progress in realistic simulated environments. She claimed that W/ARE would have "tremendous implications for our future", and "must be protected at all costs". Xiāo Cheung - The Creator, and Founder of W/ARE technology. He claims to have created this technology because of his childhood dream of being able to live in a virtual world. Huáng Zhìmíng - The CEO of W/ARE. Graduated alongside Xiāo at the University of Electronic Science and Technology of China with a Masters in Business. Arnaud Lacours - The man behind Philo Jeux, a French indie games studio that was developing a game for W/ARE called The Tablets of Mnemosyne. Production on the game was halted after Arnaud had gone into a comatose state. Dr. Geraldine Nadeau - A doctor researching lucid dreaming methods. Geraldine took interest in Arnaud's unusual brain activity during his unconscious state and took him into her care. Mr. Zheng - A W/ARE employee who violated the R&D sector's disclosure policy of reporting all knowledge obtained from R&D tours immediately. Zheng diverged from his planned tour path to inquire on a discovery, which prompted W/ARE to launch a public investigation into his whereabouts. Sacramento Research Lab / Director: Helga Johnson - The lab that housed the remaining 12 dreamers before they were relocated by Myriad's field team. There were another 10 W/ARE Labs discovered by Myriad's research team that no details have been made available about. A game title listed on an update to W/ARE's staging server. The fluency between the puzzles involving this post and the Waking Titan terminal's Mercury updates made it apparent that the Mercury Process had something to do with this. The exact terms of the connection were never fully explained, but a direct connection to No Man's Sky is suggested by the use of version 1.5 of the application and ware's software. The announcement of No Man's Sky NEXT and the "port" to the W/ARE platform followed shortly after. Satcom is Myriad's Satellite Communications API. Here, you can interface with a W/ARE-assigned Myriad satellite. Myriad Code: CJ-16-02, this satellite is storing the consciousness data of W/ARE Sacramento test subjects, also known as dreamers. Twelve W/ARE test subjects trapped in a state of "artificial dreaming" following experiments involving special exosuits and post-VR headsets at the Sacramento Research Lab. Emily was met with a disruption in her plan to preserve W/ARE's technology for the ideal future when she was unable to extract these dreamer's consciousnesses from the satellite due to memory fragmentation and data corruption. She would need to reach out to the CSD for assistance. We would be advised to guide her interactions with these dreamers with the intent of triggering a distinct emotion, or memory that could help reconstruct their memories fragments and secure a safe-as-possible extraction process. "Alexander is an 86-year-old French Canadian man, working as a farmer for his in-laws. He has two brothers and a sister, Napoleon, Jolene, and Jacques. Their family had two cows named Mabel and Eugenice, and Lionel, a bull. Lionel was their pride and main attraction at the fairs they attended, and where Alexander met his wife Emilienne. He has a condition were he can't recognize faces. Alexander thought he was going to California for a sleep study, but it ended up being a bit more than that." #231187661T was the only corrupted dreamer who didn't die amidst the mass disconnection event. However, without an extraction attempt their consciousness would remain trapped within the ever-drifting satellite. "Claire, a 15-year-old student. Volunteered for W/ARE's experiment to bring in extra money to help her mother, because her father left them 3 years ago. She spends her time with either her 4-year-old dog, Pepper, or by reading comic books alone in her room. Her goal for when she gets out of the satellite is to rebuild her friendship with her best friend from the real world, Emily." "Toby is a 5-year-old boy, who lives a peaceful life with his parents Mark and Ashley, and their 12-year-old cat Bugsy. At a young age, Toby had a run-in with a dog that caused him to fear them ever since. He lives with a rare condition which causes memory loss, and his parents entered him into the W/ARE experiment in the hope it would help with his condition. Unfortunately, they were wrong. In real life, his favorite plushie is by his side. In the satellite, Toby has only his hopes to return to his parents." "Eun Ha is a young Korean woman whose childhood was pretty turbulent. Living with an abusive father, the death of her mother shook her enough to make her want to relocate to the United States of America. She wanted a new life for her and her brother, although he still holds a grudge against her for leaving him and her father behind. She volunteered for W/ARE's experiment for extra money, but surely she couldn't have predicted this outcome." "Phillip Moretti, a 38-year-old mechanic at his family business and ex-restaurateur, lives in New York City with his wife, Martha, and his two sons, Sam and Zack. Phillip volunteered for W/ARE's experiment to regain the money he lost after his bankruptcy. His wife asked him to do it without knowing the effect it would have." Tariq died on July 6th, 2018 following the conclusion of the Myriad security diagnostic. Which ended in all servers running W/ARE processes communicating with the satellite being shut down. "Mike Pasquale, an ex-soldier from the United States Army, used to live in Burlington, Vermont. He enjoyed sailing his boat, Tranquility III, on Lake Champlain with his now ex-wife, Rachel. Feeling unfit for civilian life, he decided to volunteer for W/ARE's experiment to try something new in and maybe feel a little more alive. Little did he know he would become trapped in a satellite... but is it for the better?" "Isabella Schiavone is a 25-year-old girl born in Italy, who moved as an infant to California. She now lives in Venice Beach with her girlfriend Stephanie, and their 2-year-old puppy Pepito. Isabella volunteered for W/ARE's experiment to get some extra money to buy her girlfriend a trip to Thailand for their 4th Anniversary... or a road trip across the United States of America." "Alisha Brown would've been the grandmother of the year, if it weren't for the fact that her children don't come to see her that often. This 72-year-old woman used to work as a nurse at the general hospital in Tucson, Arizona. To keep her loneliness at bay, Alisha keeps multiple cats and enjoys watching crime shows on television. She volunteered for W/ARE's experiment so she could tell her children that she was going under observation in a private clinic, in hope that they would come and see her more often." "22-year-old Nina Flores from Santa Monica was a high school friend of Simon Quinn, a fellow dreamer. She lived a normal life with her parents, Thomas and Jennifer, and her 6-year-old dog, Jackson. She enjoys sitting on a bench during the fall or spring time to read fantasy books from one of her favorite authors, Tamora Pierce. Nina volunteered for W/ARE's experiment after she heard Simon talk about it in one of his streams." "Simon is a 23-year-old known as Simonthegreatone, a streamer gaining rank as the days go by. He never knew his father, who left his family behind while Simon was still an infant, leaving his mother all alone with two boys. His grandmother took care of him when it became clear his mother couldn't care less about her kids. Growing up, Simon created his own family with his friends Alex, Nina, and Ranjit. They created a group called The Guild of Adventurers. Unfortunately, with time, they all lost touch. Simon volunteered for W/ARE's experiment to gain more fame and to be the first one to test the port of his favorite game. At least, that's what he thought." Physically present, experimental exosuits wore by the dreamers at W/ARE's Research Labs, seemingly with the intent of providing the conscious experience of deep REM dreams without the need to actually sleep. These suits were manufactured and shipped to W/ARE by an undisclosed company. The exosuits were also found to exist in a virtual sense too: They were added in the NEXT update for No Man's Sky, replacing the old suits wore by the player character. Insightful tidbits regarding these exosuits can be found in the Medical Extract section of the dreamer patient files. They can be found compiled here or can be accessed directly from the Satcom Dashboard. What is the connection between Waking Titan and No Man's Sky? In the ARG, the No Man's Sky universe comes into existence as a result of Loop16's dreams. The Mercury Process or "Mercury," is the code-name No Man's Sky often goes by in the ARG. In Season 2 however, No Man's Sky was referred to in an increasingly meta way as an actual video game, even referenced by some of the dreamers. What are the relations between events in-game and Waking Titan? The effects of events taking place during Waking Titan can be felt in "shockwaves" via No Man's Sky's updates. However, in-game lore can act more-or-less independently from the ARG. 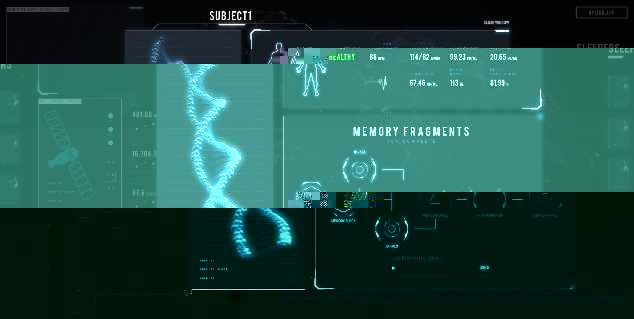 Though connections and references to the ARG can be found in the game itself, they are rather limited. This has led to numerous theories regarding the connection between both stories, although nothing is conclusive. What is W/ARE's relationship with Myriad and The Atlas Foundation? W/ARE is one of Myriad's clients with involvement in the Atlas Foundation's Mercury Process. Attention was diverted to W/ARE when they suspiciously began uploading corrupted data to the Myriad cloud, later learned to be consciousness data of their trapped user-base. The Atlas Foundation swore to allocate the necessary storage and processing power of Myriad to W/ARE to keep their processes intact, and keep their trapped users alive until a solution was found. This re-allocation had an impact some the Atlas Foundation's experiments utilizing Myriad's cloud. Most significantly Loop16 aka Emily, whose predictive capabilities and communication software stored in Myriad's cloud were heavily degraded as a result of the corruption and power deprivation. What happened to the other dreamers? There was mention of other test subjects from the Beijing facility who died during attempts at disconnection or due to immoral practices; despite W/ARE's attempts at covering their tracks. There was also mention of people like Arnaud, who went into a coma following a malfunction of the experimental W/ARE headset shipped with W/ARE developer kits. While these individuals can't necessarily be considered dreamers, from Satcom teaser images we may infer the name "sleepers," due to the right-side text, and their use of these experimental headsets without wearing an exosuit as evident by the image portraying a human body in contrast to the dreamers we know now. 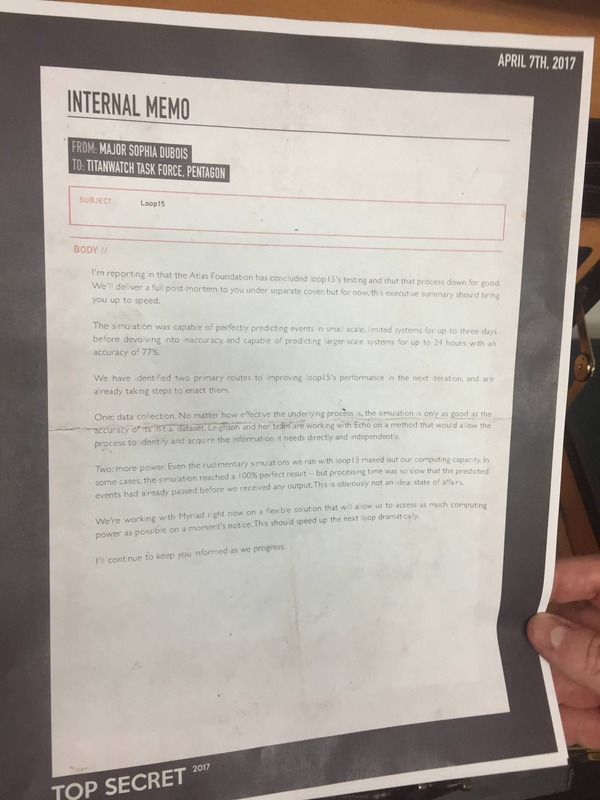 We may also infer from this document that these individuals comprised the "control group" during exosuit experimentation due to no further clarification. Emily claimed to have been able to interface with, and successfully disconnect some of these victims prior to the CSD's involvement in the dreamer extraction process. 1.5 was build version 1.5 of the Mercury process; or otherwise, No Man's Sky. What are the Atlas Pass v4s? Physical card stock Atlas Passes that were shipped to 10,000 CSD members who entered for a chance to receive one in a survey from Season 1. The bulk of passes were delivered shortly before Season 2, but weren't made use of. However, towards the end of Season 2 people were invited to apply for a chance to receive one of the 16 special limited edition Atlas Passes which they stressed will bear heavy responsibility. This implies they will be needed in a future collaboration. This page was last edited on 17 October 2018, at 17:56.